'Historic' Gun Bill Becomes Law In Connecticut : The Two-Way Lawmakers in the state where a gunman killed 20 children and six educators at an elementary school last December have responded with legislation that bans assault-style weapons and high-capacity magazines and requires background checks for purchasers. 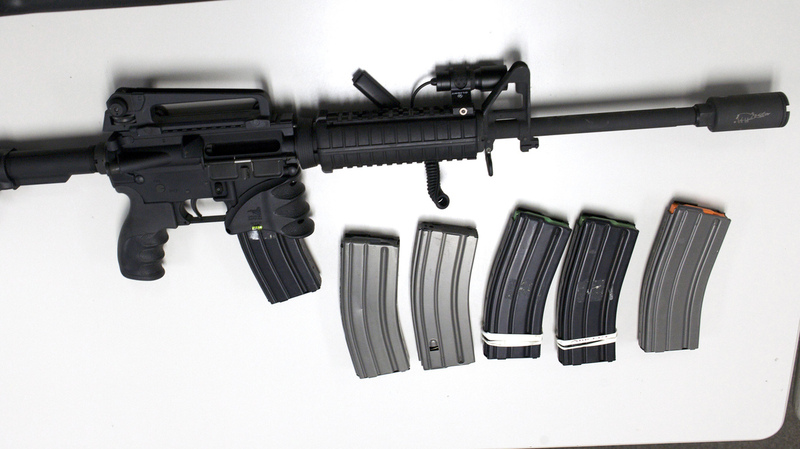 A Bushmaster rifle, similar to the type used by Adam Lanza during the shooting at Sandy Hook Elementary School, and some ammunition magazines. The sale and possession of this type of weapon, and high-capacity magazines, will be severely restricted in Connecticut under new legislation. Saying that on this "profoundly emotional day" he hoped that his state would serve as an example to the rest of the nation, Connecticut Gov. Dannel Malloy sat down Thursday at 12:20 p.m. ET to sign into law what's being described as the most sweeping gun control legislation in the nation since the Dec. 14 school shooting in Newtown, Conn.
Malloy praised lawmakers and those who helped craft the legislation for coming together "as few places in our nation have demonstrated the ability to do." Before the governor put pen to paper, Deborah Davis of Hartford told those gathered that "our children are crying out from the grave, telling us to stop this violence." Her son Philip was shot to death in 2010. Nicole Hockley, whose son Dylan was among the 20 children killed at Sandy Hook Elementary School last December, thanked the lawmakers. "Our voices have been heard," she said. "We want Newtown to be known, not for our tragedy, but for transformation." As we reported earlier, the legislation puts extensive restrictions on the sale of weapons, ammunition and ammunition magazines in the state. Legislators in Connecticut, where 20 children and six educators were killed four months ago in one of the worst mass shootings in the nation's history, approved legislation early Thursday that puts extensive restrictions on the sale of weapons, ammunition and ammunition magazines in the state. Proponents, The Hartford Courant reports, call it the "toughest-in-the-nation" response to the shootings at Sandy Hook Elementary School in Newtown. Ebong Udoma of NPR member station WSHU in Fairfield, Conn., tells our Newscast Desk that the bill "includes an expansion of Connecticut's assault weapon ban, background checks for all gun and ammunition sales, a new registry of existing high capacity magazines and a ban on the sale of magazines holding more than 10 bullets, starting next year." The "historic gun control" bill, writes the New Haven Register, "also addressed mental health reforms and money to make schools more secure." The state's Senate passed the legislation Wednesday afternoon by a vote of 26-10. The Courant says "two of 22 Democrats and eight of 14 Republicans [were] opposed." Then at 2:26 a.m. ET Thursday, the state's General Assembly gave the legislation its approval. The vote was 105 to 44. "Of the 98 House Democrats present, 13 voted no; and 31 of the 51 Republicans in the hall voted no," the Courant says. Gov. Dannel Malloy, a Democrat, is expected to sign the legislation into law around midday. A copy of the bill is posted here. "In a compromise, owners of ... large-capacity magazines would not be required to turn them in, although their use would be restricted and they would have to be registered with the state by Jan. 1, 2014. Likewise, people who already own semiautomatic rifles defined as assault weapons could keep them if they submit to new registration procedures. "Beginning Oct. 1, all purchases of ammunition and long guns would require an eligibility certificate. To obtain certification to buy ammunition, purchasers would have to pass a federal criminal background check." "A dangerous weapons offender registry, training for school personnel to recognize mental health issues among children, threat assessment teams at colleges, new eligibility certificates to buy any rifle, shotgun or ammunition, stricter firearms storage rules and tougher penalties for weapons trafficking, among other things." "Followed a boisterous demonstration by pro-gun advocates who were bused to the Capitol with the help of the National Rifle Association. The crowd of pro-gun advocates rocked the Capitol Wednesday with shouts of 'just vote no' ringing from multiple floors as some lawmakers walked through."